So close your eyes for a minute and tell me what do you see. I bet you're seeing the same thing I'm seeing... absolutely nothing at all behind those closed lids. Why can't it always be that easy to see the very same thing the next person does ? Why can't it be that easy to effortlessly have the same vision and perspective as others do.. especially those that are ridiculously successful or influential. Nevertheless, we know it's not that easy and conversely we deal with our own individual challenges. Challenges that we face with respect to writing and in SEO. Lets think about challenges for a minute. What's the natural reaction to the challenges in your life ? What are your challenges when it comes to creating content especially in conjunction with search engine optimization ? Challenge by definition is having difficulty in a job or an undertaking that is stimulating to one engaged in that situation and like me, on a daily basis I'm sure you likely encounter your fair share of testy moments too. As a blogger, a marketer or general website owner, Google is by far the biggest challenge online. Love it or hate it, we've got no choice but to put on our big boy or girl pants, jump in the ring and rise to the challenge that the Big G presents us daily. Sadly, if you're not at the top or a big brand, it feels like that silver ball in a pinball machine getting knocked around senselessly until you come up with a winning strategy. Google says that you have to play by the rules in order to have a place at all in the SEO game. So what do you do ? You devise a new project online... Like a rule follower, you toil away finding that near perfect niche, the right keywords and spend hours upon hours writing content that you desperately hope will get ranked well in the search engine and then it happens.. you hit that impending wall where thoughts, ideas and content just stop flowing the way they used to. Do you pay for content now ? Is this is a good idea or a bad one ? What do I do, what do I do ? Will Google love me or hate me ? Seemingly just a few missteps can lead to SEO doom, watching the walls inching in closer to leading your website into the Google abyss of no return. If you're a brand or a company that was interested in expansion that may not have time to create content quickly, outsourcing may be the way to go. The development of a content strategy supported with goals that can leverage your brand and business is a valid reason to consider outsourcing too. Not that I want to shy away from giving you a definitive answer on what you should do with respect to outsourcing content... I do think everyone can approach this uniquely. There are reasonable questions to ask yourself. Are you capable of producing high quality content on your own free of careless grammatical errors ? Do you have the ability to remain focused in the content creation process ? I hear this one all the time.. can you tell a story ? Better yet, can you tell a story through the content you create ? Can you develop ideas and produce content regularly ? Have you set goals for your content strategy ? Do you have a content strategy ? Surely, there are more questions that can be asked, but the reality for most is that content creation is time consuming and it's not for the faint of heart. Outsourcing is a pretty simple concept.. Paying someone else for a skillset, right ? Well in this case, we're talking about content that reaches our readers, adds value to our business, brand or website and content that effectively affects our SEO. So lets assume for a minute that this is a strategy that you want to employ. You can't just jump in the water and say hey, you look good so why don't you start writing content for me and ohhhh, while you're at it, make sure you embed keywords that have decent search volume and are aligned to what my content is about too. This is just good business sense.. make sure the content provider can provide updated and current examples of their work. Does the provider believe that "content is king" ? Do you ? What is their content belief system ? The closer the two of you are in terms of how you approach content creation or what your core values are with respect to the content that will be provided, the more successful that relationship is going to be. The provider should be able to demonstrate an ability to write well on the niche that you need content for. Do they have quality control standards for the content that they will be producing ? What are the rights pertaining to the content that is created for you ? Do you own the rights, do they ? Can this content be republished elsewhere ? What is the providers stance on duplicate content ? The provider should be able to provide both short term contracts, long term contracts and a seamless way for you to end your contract with them in the event you are unsatisfied after they have been contracted. The provider should be able to provide multiple means / forms of contact to promote routes for meaningful communication. Responsiveness of the provider isn't something that should be overlooked. A good provider likely won't have a problem giving you a trial run to allow you to "test" their services. You get what you pay for so a provider that looks cheap is probably going to give you mediocre results. 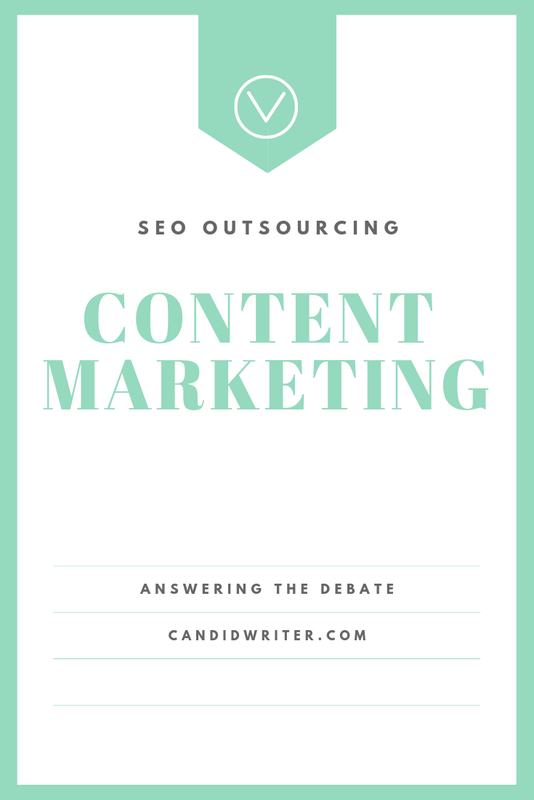 This is just a short list, but as you can see there are several items to consider before making the leap to content creation outsourcing. Content and search engine optimization go hand in hand and the same considerations that you make regarding your content will ultimately affect your SEO as well. Call it a dialogue, a chitchat or a conversation, but there's a lot to consider on the topic of outsourcing. Hopefully I've shed some light on some aspect of it and have given you some things to think about too. I'm a proponent of writing my own content because I feel more connected to it, but whether you write your own or outsource it that is something completely up to you depending on your own individual situation, limitations if any exist and your own needs as well.